Hannah Ferrier’s got no shame in her game, and I kind of love her for it! 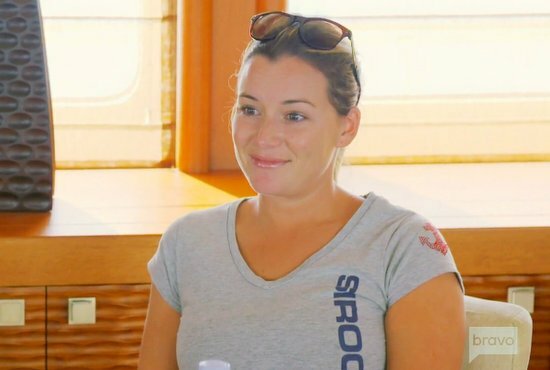 After kissing Greek God-like charter guest, Jason, on last week’s Below Deck: Mediterranean, the canoodling couple were outed when first stew Bugsy Drake found Hannah and Jason‘s texts on the yacht’s master iPad. Hannah calls out Bugsy and Bobby Giancola’s reading of the private messages – and their Scooby Doo antics afterward – as immature. Hannah admits, “It was definitely a case of the angel on one shoulder and devil on the other. Despite the obvious chemistry and flirting, once he actually kissed me, I had a realization that this needed to wait until after he had left the boat. So in short – a very quick kiss!” Hmm. Not sure if I believe that. But I ain’t mad atcha either way, Hannah! “If they read those texts, what else did they look at on his phone? !” wonders Hannah. “All texts were sent after he left the boat so he had done nothing wrong.” Well, okay. But to play devil’s advocate, Hannah would likely have BLASTED any of the crew who had engaged in similar shenanigans. And something tells me that she would have also eagerly read any and all texts that crossed her path, had situations been reversed. So there is a level of hypocrisy at play here, for sure. TELL US: WHAT DO YOU THINK OF HANNAH KISSING JASON? WAS THE CREW WRONG FOR READING AND SHARING THEIR TEXTS?